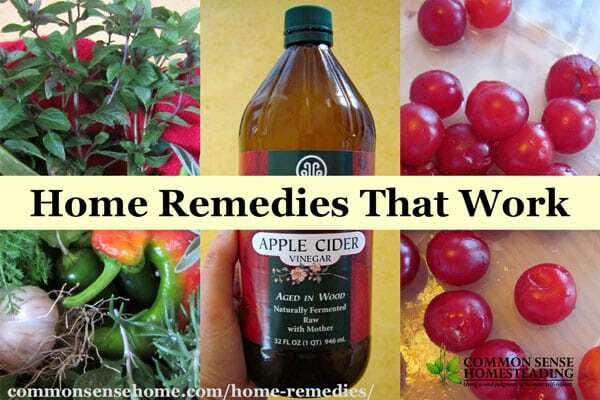 As a mom, I've lost count of the times I've used home remedies for my family over the years. It's such a blessing to be able to turn to the pantry, garden or herb stash to help relieve pain and treat minor ailments. Natural cures are convenient and cost effective – you can even use common weeds for herbal medicine. At Common Sense Home, we've built an extensive natural medicine library, sharing what works for our families. REMEMBER – Always see a trained health care provider if symptoms are severe or last an unusually long time. The posts on the site are for information only. I share what works for us and our readers, as well as the latest research. Winter is generally cold and flu season, but viruses can hit any time of year. I work to boost our immune systems through the use of herbs and probiotics. If symptoms hit, there are natural treatments that may help reduce the duration and severity of the illness. See also treatments for coughs, congestion, earaches and sore throat. 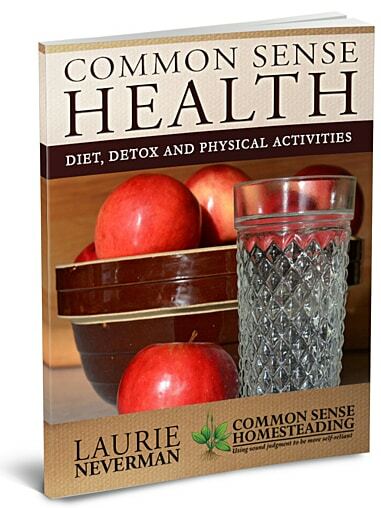 Get the Home Remedies series in convenient kindle format, bundled by topic for natural cures when you need them. In 2015, I was diagnosed with psoriasis, which covered large areas of my body in red, crusty, peeling skin. It was extremely painful, and made me uncomfortable going out in public. (A large area of my face was affected.) When I went to the dermatologist, she basically said, “Live with it.” Thankfully, through research and trial and error, I found a solution that worked for me. My skin is now clear and smooth except for a few small patches. (No more scaring small children.) I share my story in the following posts. WARNING – graphic images. The “before” photos were not pretty. This section is mostly for the ladies, but gentleman may sometimes have breast issues, too. Too often we do so much for others, but forget to take care of ourselves. A little self-care can go a long way to prevent illness and heal. A key point in natural medicine is daily self care. There are many simple steps you can add to your daily routine to improve your health. Self-diagnostics, like checking your poop, can help you spot problems before they get severe. The Autoimmune Epidemic – Can Detox Treatments Help? What you put on your body is as important as what you put in your body. Transdermal medications work because things absorb through the skin. I recommend skin care products with simple, non-toxic ingredients, and avoiding synthetic fragrances. Sometimes natural remedies are enough, sometimes you need a little extra help. It pays to be prepared for minor medical emergencies with some basic equipment and training. (If you have the time and ability for advanced first aid training, even better.) My husband had EMT training and I come from a farming background. Between the two of us, we've seen and patched up a number of messy situations. Hippocrates said, “Let thy food be thy medicine and thy medicine be thy food.” Good health is impossible without proper nutrition. Each of us are unique, so our nutritional needs will vary. That said, good food, well prepared, should be part of the foundation of wellness. Would You Feed Your Kids Pesticide Chips? When I first started writing, hardly anyone had heard of live culture (fermented) foods. Now, yogurt, kefir, kombucha, raw kraut and more are common items in many grocery stores. Live cultures have proven benefits as probiotics, improving gut health. Store fermented foods are great for convenience, but you can save a lot of money if you make your own. Fermenting at home also allows you to experiment with different flavors and food combinations. Water Kefir Versus Kombucha – What’s the difference between water kefir and kombucha? How to Flavor Kombucha – Holiday Flavors – Fun seasonal flavor ideas. Herbs can be wonderful as a daily tonic, and are also useful as a first aid option. It's darn handy to grab the right leaf out of the garden and slap it on a mosquito bite to relieve the itching. I'm partial to wild plants (weeds), since they grow with little care, but I do cultivate a few favorite herbs. Whether you grow your own or purchase quality herbs, it's worthwhile to make herbal medicine a part of your life. Please see also the “Herbs and Wildcrafting” page. Don't forget to Pin or Bookmark this page! Originally published in 2012, updated in 2017.
does any one know of a good natural cure for flees. they are really bad here in texas, and eating my dogs alive. i have tried ever thing i can find and nothing is working. suggests rosemary flea dip, lavender essential oil, brewer’s yeast, apple cider vinegar or lemon spray repellent. Thankfully we haven’t yet dealt with fleas, so I haven’t tried any of these. Here in Tennessee, I found that feeding my dog a clove of garlic a couple of times a week helped keep the fleas off. My dog loved the flavor. Garlic is safe for your dog when you feed it in appropriate amounts as I’ll explain later. However, there are some cautions. Always be cautious with any medicine or supplement for pregnant dogs. Consult your holistic veterinarian when feeding garlic to expectant mothers. Garlic also changes the taste of breast milk so avoid feeding it to nursing dogs. Don’t give garlic to puppies under six months. Puppies eight weeks or less don’t produce new red blood cells so never give them garlic. For puppies aged six months to a year, you can be cautious and feed half the regular dose. Veterinary herbalist Susan Wynn warns against giving garlic to Akitas and Shiba Inus. These breeds are more sensitive to the hemolytic effects of oxidants such as N-propyl disulphide found in garlic. Consult your holistic vet if you have concerns about your dog’s breed related risks. Don’t use garlic if your dog is on any of these drugs. Since garlic affects blood clotting don’t use it two weeks before any scheduled surgery. Lots of Brewers Yeast in my dog’s water helped deter fleas. Works in humans for mosquitoes as well. Increasing B Vitamins as in Brewer’s Yeast creates a smell that fleas and mosquitoes don’t like but is great for the dogs and the humans. I appreciate your natural health writings, i.e., on MSG, etc. It’s challenging to reach people that the primary cause of their chronic health conditions is the food that they eat. Unfortunately most of Americans are not homesteading or living in a rural life but part of the big city buzz. And there is a price that they pay for that. We’re on the same team, trying to reach people at where they are. Keep plowing away! Hopefully what I term as “turning on more light bulbs” will turn on. I hate to think where this nation will be 20 years from now if we don’t start improving our eating habits. Was very insightful and interesting! 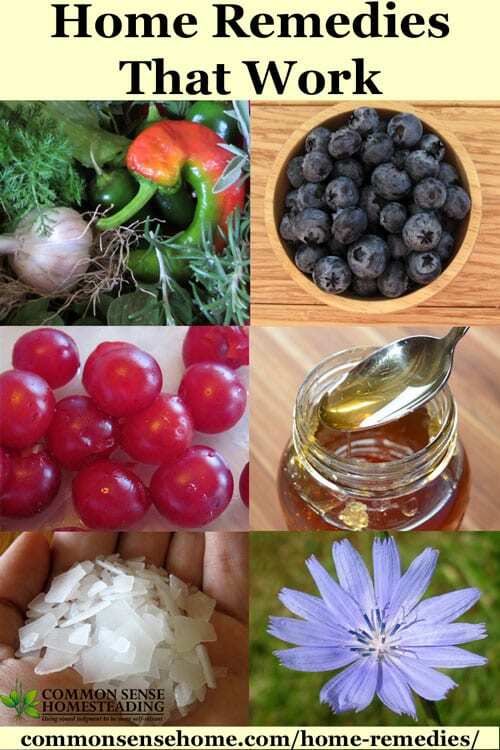 Hi, I’m new to your site and have read almost on your Natural Remedies that you have posted. I love them, and have used a few of them already!!! I’m hoping that you might be able to help me with a problem that I have. I am 57 and have already gone through menopause (hot flashes, etc). Now, I’m experiencing a problem with my fingernails. They are very thin, easy to tear, and actually have a ripple look and feel. They are not discolored, and I don’t wear nail polish at all (never have). I also take a Calcium (1,000mg) Magnesium (500mg) supplement and have for years. I also have been eating as much natural, no sugar, raw milk, water kefir, homemade yogurt, etc as much as possible. In fact, my DH and I went to Easter lunch with friends and decided to eat a piece of fruit pie. What a mistake……….way to sugary and yuck!!! I am very thankful that the pie didn’t taste good because that means we have made the transition off white sugar. We really never consumed very much sugar unless it was in baked sweets. But now since we have consumed any since Christmas we see how much it doesn’t really taste good or feel good!!! Now, back to the reason I’m posting this question. I would really appreciate some help if anyone know what the problem could be with my fingernails. The problem has only been in the last year to year in a half. I have asked 2 doctors……..they had no idea what would cause this………just chalk it up to menopause was their response. It’s a shame that standard medical practitioners have so very little to do with nutrition. There are a few things I can think of off the top of my head. One, make sure your thyroid is doing what it should be doing, as low thyroid function is commonly linked to brittle nails. Two, consider your K2 levels. Vitamin K2 (not vitamin K) is very important, especially for post-menopausal women, to help the calcium get where it needs to be in our systems, instead of it building up in our arteries where it should not be. The book “Vitamin K2 and the Calcium Paradox: How a Little-Known Vitamin Could Save Your Life” was a real eye opener for me. Natto is the best natural source of K2, but Gouda and Brie cheese are also fairly high in it. Supplements are also available. Another thing to check is zinc levels. Brittle/ribbed fingernails and stretchmarks are often linked to zinc deficiency. Finally, gelatin. collagen peptides, and bone broth are great for gut health and strong hair and nails. Where do you find vitamin K2? Is it only obtained in food? Thank you for all the info and research you do to help others. You’re welcome. You can get K2 from food, but the highest concentrations are in foods most people don’t eat regularly. Natto (a fermented soybean product) has far and away the highest amount per serving. Other top sources are goose liver pate and Gouda and Brie cheeses. Most of the sources of K2 are animal products. More are listed at “K2: The Missing Nutrient“. Grassfed and wild animal products, especially organ meats, will have higher amounts of K2. You can also find it in supplements. The one I am currently taking is the Swanson Ultra Natural Vitamin K2 with Nattokinase. My nails have improved 100% since I started taking Hair, Skin and Nails (available at Walmart). I also take an additional Biotin capsule (also available at Walmart). Biotin is good for hair and nails. They are growing stronger than ever. It’s worth a try. I to had very thin nails &brittle. So i started taking D3 vitamins@ 5000 mg &600 calcuim every day for the last 8Yrs.has worked really well beautiful nails now worked for me. J.G.